CHM HTML Help files, Web Help systems, Printed Manuals, Adobe PDF documents, Microsoft Word documents, and ePub eBooks from a single source. Quick overview of HelpSmith key features combined in an easy-to-use help authoring tool with a slight learning curve. 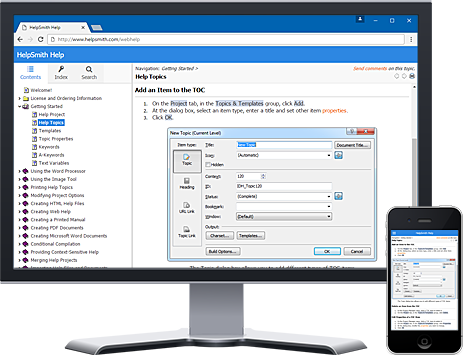 Learn how you can use HelpSmith to create a CHM help file, online Web Help system, or PDF manual from a single source. The unique solution that you can use to automate the process of writing documentation for user interfaces. Built-in Image Tool to capture and insert screenshots. Various annotations for images: rectangles, ellipses, arrows, balloons, lines, text labels, control annotations for UI elements, and other objects. Hotspots to create clickable areas on an image to link to a topic, or to an external URL address. Crop Tool to modify a captured screenshot by removing unwanted parts of the image. The ability to capture the mouse cursor. 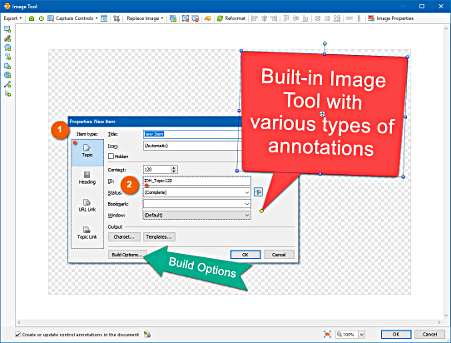 Flexible settings to customize the appearance of annotations. Control annotations for user interface elements on a captured screenshot. Automatic generation of the topic where you can provide a detailed description for controls. The ability to recognize controls on a captured window. Customizable style schemes for control annotations. Responsive layout compatible with desktop computers and mobile devices. Fully customizable Header, Footer and Mobile Header areas. Easy integration with Google Analytics. Automatic Google XML Sitemap generation. Support for Facebook and Disqus comments. Built-in web server for testing a generated Web Help system on a local computer. Easy integration with a website or application. Multiple output formats from a single source: HTML Help (CHM), Web Help, Printed Manual, Adobe PDF, MS Word, and ePub eBook. 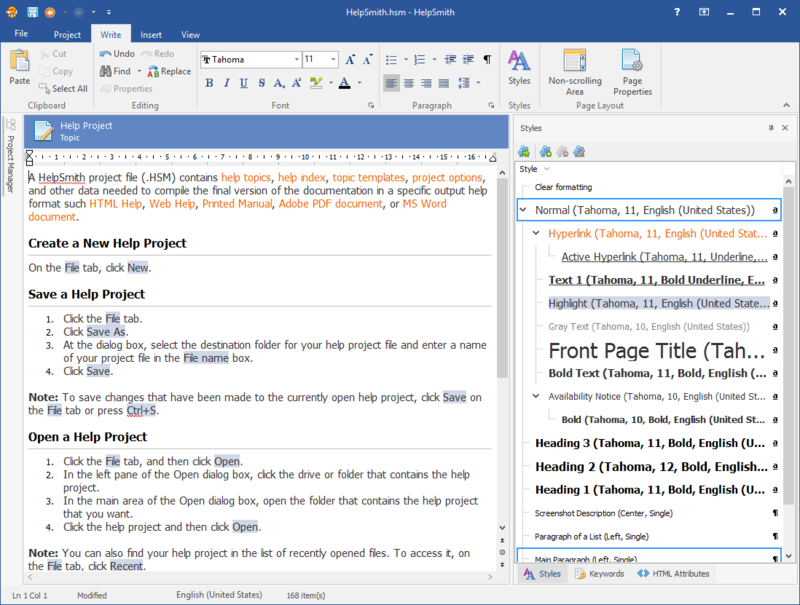 The ability to import HTML, CHM, HHP (with CSS support), and MS Word files (including documents with Table of Contents). 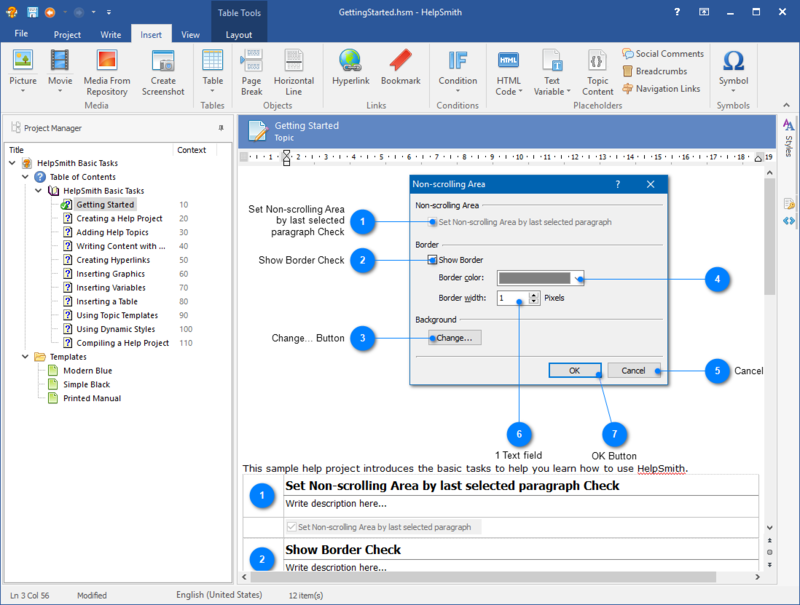 Full-featured word processor: dynamic styles, spell checker for different languages, and Unicode support. Most powerful Conditional Compilation capabilities based on build tags. Topic templates to customize the appearance of your help file or document. Optimized for working with large help projects and usage of minimal system resources. Download your FREE evaluation copy of HelpSmith today! © 2007-2019 Divcom Software. All rights reserved.